Finally, Google Chrome has been upgraded for Windows 8. Well, there is no drastic change between desktop version and the very new Windows 8 version. The Windows 8 version has thicker tabs, slightly different color theme, wrench icon has been replaced with a different icon having three horizontal lines. The default browser in Windows 8 has been set to ‘IE’ where all the HTTP websites get opened automatically. Now, to open it in Chrome automatically, you need to set Google Chrome for Windows 8 as you default browser. Also, to enjoy the all new modified Chrome in Windows 8, you need to set it as default. Let me give you a step-by-step tutorial on how to set Chrome as default Windows 8 browser. You can also check out more Windows 8 Tutorials. Once you have successfully installed, open it. Head over to the ‘Settings’ option. Under the ‘Default Browser’ settings, click on ‘Make Google Chrome My Default Browser’. 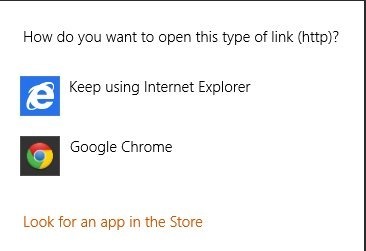 This will bring you a pop-up where you need to select your default browser. Click on ‘Google Chrome’ to set Chrome as your Windows 8 default browser. Go ahead and experience the difference yourself. Download Google Chrome for Windows 8 now.